Walking with Jesus: Day 11: Matthew 5:17-30 & Psalm 11: How did Christ fulfill the Law? How do Christians relate to the Law? Day 11: Matthew 5:17-30 & Psalm 11: How did Christ fulfill the Law? How do Christians relate to the Law? How did Christ Fulfill the Law? How do Christians Relate to the Law? Many people seem very confused about God's law lately. Christians seem to know that we're not supposed to commit adultery or steal, that the Ten Commandments still apply to believers (though we don't take #3 & #4 very seriously). We also seem to know that laws calling for the execution of adulterers and homosexuals are not to be carried out today. And when we go to church, we don't sacrifice animals and get sprinkled by blood. But what's our basis for thinking and acting this way? Is it just a "holy intuition" that allows us to observe some laws and disregard others? Jesus sais He did not come to abolish the Law and the Prophets but to fulfill them. He then said, "not an iota, not a dot, will pass from the Law until all is accomplished." How did Christ fulfill the Law and what continuing relevance does the Law have for believers? Moral: At the heart of the Law is the moral aspect, which ultimately reflects the character of God. The moral law is summarized in the Ten Commandments and the two great commandments to love God and to love our neighbors as ourselves (Matt. 22:37-40). Civil: Israel was also a theocracy, a kingdom among the kingdoms of the world. Jesus nullified the theocracy-state of Israel when He said, "My kingdom is not of this world" and then commissioned His apostles to "Go and make disciples of all nations." So the civil aspect of Israel's laws were fulfilled when Jesus as the King altered the nature of the kingdom and its relationship to the kingdoms of the world. Ceremonial: The Law also regulated Israel's worship. Regulations for cleanliness and dietary restrictions were designed to mark God's people as holy, distinct from the nations. The sacrifice and priest system of worship was designed to show God's people their ongoing need for forgiveness and to point them to Christ. Jesus fulfilled this aspect of the Law when He died on the cross and ascended to heaven as our Great High Priest. He then sent His Holy Spirit to indwell all believers, and it is the Holy Spirit who marks us as God's people, not the dietary laws. The moral law of God reflects His moral character. Christ fulfilled it for us by keeping it perfectly and earning a perfect righteousness for us, but we remain obligated to keep God's commands. We do not do so to earn a righteousness or salvation, but we do so because the Holy Spirit is conforming us to the image of Christ more and more. Far from lowering the moral standard, Jesus clarified and applied the moral law in a deep, thorough and challenging way in the rest of this chapter. But more on that tomorrow . . . 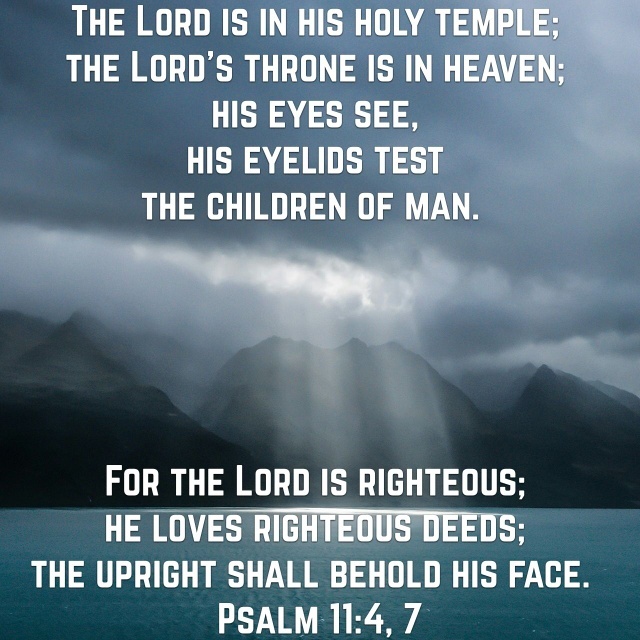 But You are in Your holy temple, enthroned in heaven, unshakeable. You look and You see, You test and You know the truth. You will judge the deceiving enemies of Your people. Lord, I do ask that You would have mercy on Your people here in America by blessing us with a leader of integrity and wisdom, a leader we do not deserve but we desperately need. Yet, whatever You may ordain for us, let us never stop trusting in You. Let us never stop looking to You and rejoicing in You. 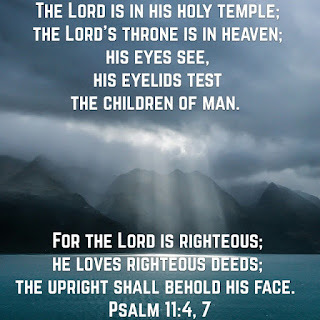 For You are on Your throne and You are good. We look forward to that day when we will see You face-to-face. In Jesus' name, Amen!